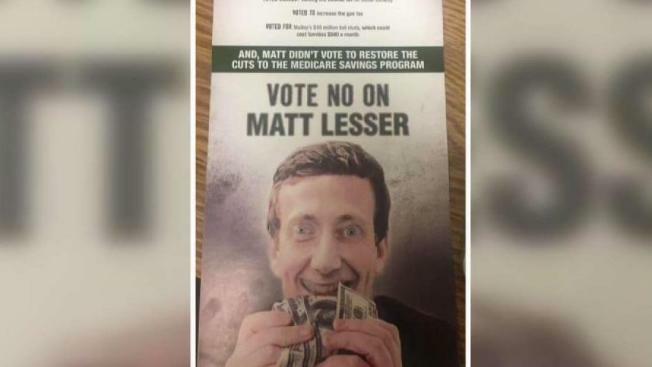 People in the Middletown area started receiving the mailer, which shows an apparently edited image of Matt Lesser – the Democrat running for State Senate 9th District, this week. Just a week before midterm elections, a controversial mailer some call anti-Semitic is making waves in Connecticut. People in the Middletown area started receiving the mailer this week. It shows an apparently edited image of Matt Lesser – the Democrat running for State Senate 9th District. The mailer says it was paid and approved by Lesser’s Republican opponent, Ed Charamut. Lesser, who is Jewish, said this is beyond what he would expect for a campaign. “I’ve seen an awful a lot of negatives ads in my time. There’s been a lot in this campaign. This is unique in the sense that no other ad I’ve seen distorts my face in a certain way. It really seems to evoke this really horrible past that we’ve moved past as a country or at least we think we have and that’s why it was so disturbing,” Lesser said. He added that what comes next is up to the voters. Charamut adds this election is a chance to move the state in a new fiscal direction. But it’s not only his Democratic opponent that has concerns about the depiction on the mailer. Connecticut Republican Party Chairman J.R. Romano called it offensive. "I had the opportunity to discuss some of the context of the recent mailer sent by candidate Ed Charamut involving State Representative Matt Lesser. Several things have come into perspective from conversations with Jewish friends, including Jewish Republicans. In a race with a Jewish candidate, this image should be recognized as offensive, raising classic anti-Semitic tropes. It cannot be justified. I personally would not have approved this mailer, and I am grateful that the party did not approve it. I have requested to sit down with the ADL to broaden my understanding of and sensitivity to anti-Semitism,” Romano wrote. The Anti-Defamation League also questioned the mailer. "As a nonpartisan, nonprofit organization, ADL does not speak out in favor of or against a candidate for elective office. The juxtaposition of a Jewish candidate and money in this manner suggests an age old anti-Semitic trope. We call on the campaign to clarify its position and intent in disseminating this image," an ADL spokesperson wrote in an email to NBC Connecticut. On Wednesday, the Charamut campaign posted an apology on Facebook.